Lyric Arts has been struggling with diversity of casting, but they've done a fantastic job here, casting many Latinx actors and other people of color. Some are new to Lyric's stage, some familiar from this or other theaters around town, and all 17 cast members give strong performances. The ensemble is important in this piece with a lot of singing, support, and multiple characterizations, and they pull it off beautifully under director Matt McNabb. 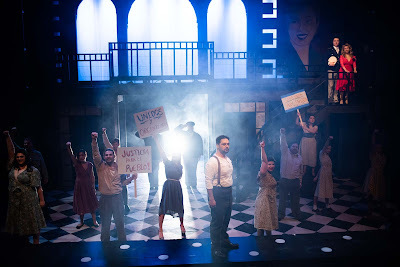 A relative newcomer to the #TCTheater scene, Kiko Laureano is a true find as Evita. Her voice is as strong and rich as her stage presence. She fully embodies this complicated heroine, and exudes confidence as Evita, while also conveying her vulnerability. Adan Varela stole scenes as the Piragua Guy in the Ordway's In the Heights a few years ago, but here as Ché he fully owns them. The role requires a strong singer with great charisma, as Ché is with us for most of the show and leads us through the story. 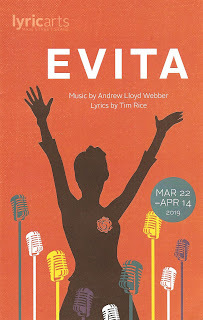 Adan's got what it takes and is the necessary grounding to Evita's extravagant life and story. 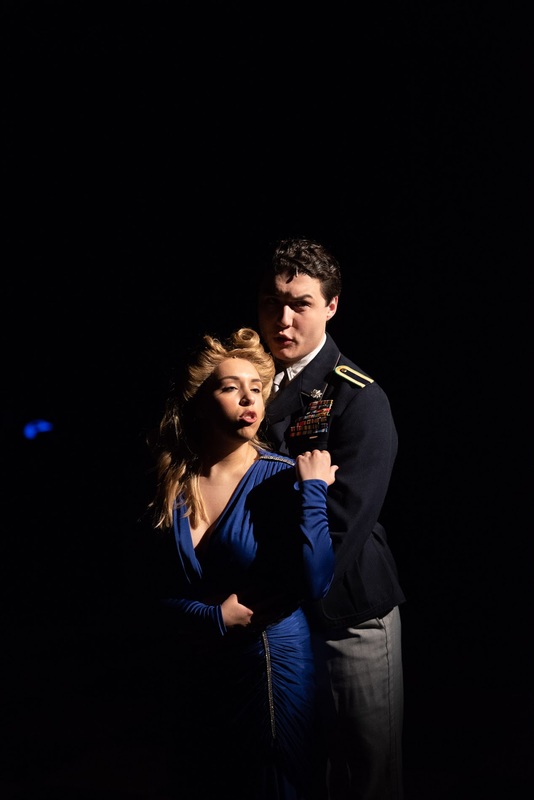 Jake Sung-Guk Sullivan is a suave Juan Perón, Laila Sahir has a lovely moment as Perón's mistress singing "Another Suitcase in Another Hall," and Derick Taylor-White is appropriately smarmy as the tango singer Evita follows to the B.A. Music director Louis Berg-Arnold leads the small but mighty five-person orchestra on ALW's complex score; they could only be better if they were onstage (space limitations force them into an upstairs room). Scenic and lighting designer Chad Van Kekerix has recreated the Peróns' home with a massive two-story set, complete with arches, columns, a moving staircase, and a huge portrait of Evita. The real Eva Perón was a fashion icon, and the costumes here live up to that. 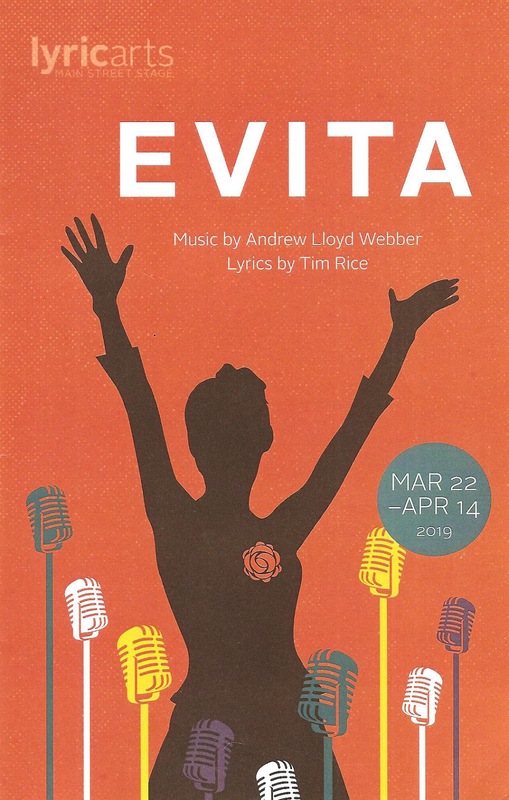 Costume designer Sara Wilcox has created a glamorous and chic array of outfits for Evita (I lost count of her many costume changes), with more somber attire for the less privileged in Buenos Aires. It's clear from the musical that despite her complicated legacy, Evita was much loved by her people and did good work in her short life. While an epic story, the musical clips along at a good pace and is just over two hours long. Lyric Arts' fantastic production continues through April 14. *Plot summary borrowed from what I wrote about the touring production a few years ago.